fuel for thought: Welcome the new Volvo V90! On June 23, Volvo Car announced it will launch a Bi-Fuel version of its new V90 station wagon. The V90 will supersede the V70 and marks a new era of vehicles with Westport technology. Based on the same engine technology as the V60 sports wagon, the V90 will run on compressed natural gas (CNG), biomethane, or petrol and with a 254 horsepower engine, will be the most powerful CNG car on the market. The Westport team in Gothenburg, Sweden is pictured here with last V70 Bi-Fuel car delivered by Westport. This high-performance, fuel-efficient vehicle has been a major success story in the European market and since the start of production in 2010, has been our best-selling product with more than 4,500 vehicles delivered. Sales of the V70 have also had a significant environmental impact. Based on an average mix of biomethane provided by the Swedish Transport Association, and a well-to-wheels perspective of expected lifetime emissions of the vehicle, a V70 Bi-Fuel emits 50% fewer green house gas (GHG) emissions compared to a petrol fuelled vehicle. This results in a savings of about 8 tonnes of CO2 per vehicle or close to 40,000 tonnes when the entire fleet of vehicles sold is considered. By collaborating with OEMs like Volvo Car, Westport have been able develop vital technology solutions to reduce GHG emissions and continue to meet demand for premium natural gas vehicles. 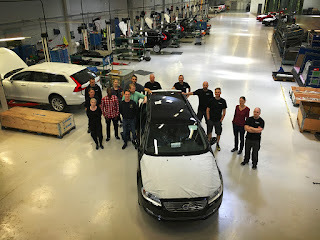 Great work to the team in Sweden, farewell to the V70, and we look forward to more success with the V90!